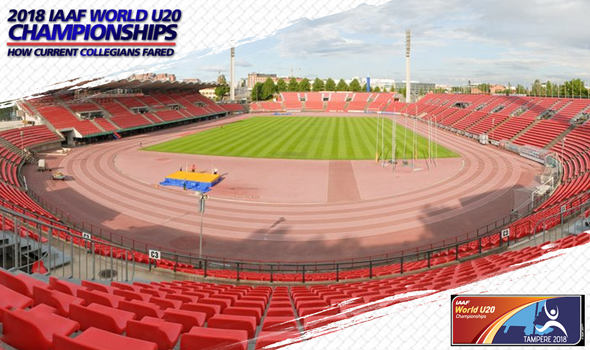 Underclassmen from the 2018 collegiate track & field season shined at the 2018 IAAF World U20 Championships this past week in Tampere, Finland. Twenty-seven institutions were represented at the biennial meet, including 24 NCAA Division I programs, two NJCAA Division I programs (Hinds (Miss.) and Western Texas) as well as one NAIA program (British Columbia). Athletes from those 27 institutions combined to win 17 medals. Five of those medals were gold as Damion Thomas (men’s 110 hurdles), Antonios Merlos (men’s high jump), Jake Norris (men’s hammer), Alexandra Emilianov (women’s discus) and Camryn Rogers (women’s hammer) stood at the top of the podium after their respective events. Five athletes earned silver medals: Adrian Piperi (men’s shot put), Twanisha Terry (women’s 100), Lauren Rain Williams (women’s 200), Lisa Gunnarsson (women’s pole vault) and Alyssa Wilson (women’s hammer). If you’re wondering who the busiest collegian last week in Finald was, that would be Wilson as she competed in the hammer, discus and shot put, just like she did at the NCAA Championships last month. Six athletes brought back bronze medals, including Eric Harrison who double dipped in the 100 and 200. Other bronze medals recipients were Chantz Sawyers (men’s 400), Juvaughn Blake (men’s high jump), Taylor Manson (women’s 400), Cortney Jones (women’s 100 hurdles) and Tara Davis (women’s long jump).